Thinking about safety isn't the sexiest way to decide where to live. It's far more exciting to think about how much money you can make in a city, or how hard its citizens party, or even how pet-friendly it is. But let's face it: Being alive is pretty chill and probably a state worth maintaining. With that in mind, we present to you this study released by WalletHub on Monday. It ranks 182 American cities from most to least safe, and even comes with a handy map that'll give you an overview of the safety of cities around the country. Because we care about you, we've also broken it down into the top and bottom 10 below. But make sure to check out the entire report to see the full list. We're not saying you need to immediately move, but if you're in the bottom 10, it'd probably be better to know. To use the map, just hover to see the ranking. The darker the dot, the safer the city is. To assemble this study, WalletHub evaluated 182 US cities -- including the 150 most populated and at least two of the most populated in each state -- on the following three dimensions: 1) Home & Community Safety, 2) Natural-Disaster Risk, and 3) Financial Safety. Those were broken down into 39 weighted metrics that were graded on a 100-point scale, and they included things like Traffic Fatalities per Capita, Earthquake Risk Level, and Identity-Theft Complaints per Capita. Finally, the numbers were averaged into overall scores, which were used to rank the cities. Keep in mind that only the city proper was considered, so this doesn't include surrounding metro areas. The list is pretty surprising, and big coastal cities are mostly absent. Of the top 10 safe cities, the most famous might be Boise, Idaho (when Boise is the most famous, you know you're on a unique list). But there's probably something to be said for moving to a place that's a little off the grid if you want a quiet and non-imperiled life. For instance, Columbia, Maryland, which took the top spot overall and come in No. 4 in Home & Community Safety, No. 63 in Natural-Disaster Risk, and No. 34 in Financial Safety. 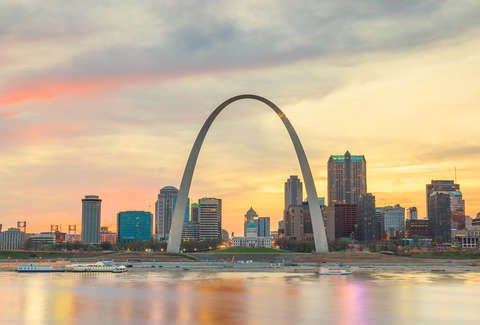 On the other end are some names you'll probably find more familiar, and, at the top, St. Louis: home of that arch, the most traffic fatalities per capita, and some of the most assaults per capita. Lest any coastal elites worry about losing their status as edgy, Los Angeles came in as the ninth least safe, with 165 in Home & Community Safety, Natural-Disaster Risk in 149, and 130 in Financial Safety. If you're more money-focused than safety-focused, we recommend checking out this list of the cities with the most jobs paying over $100K right now. But seriously, stay safe out there.